I wasn't even going to go to this, but had such a good time at the Ozzfest a couple of weeks earlier, that I just couldn't resist the chance of another day getting pissed in the sun and listening to heavy metal. Having queued for what seemed like forever on the M1 to reach the car park, we got fleeced £7 for the priviledge of parking in a field, but at least it was only two minutes from the entrance. Queens of the Stone Age riffed like crazy for nearly an hour. Top band. Offspring's dull comedy punk meant plenty of time to sling lager down our necks before AC/DC came on. I'd been to see them at Wembley the previous December and not really got it. 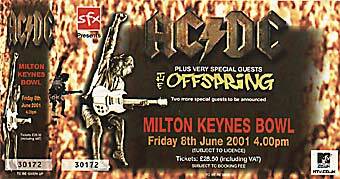 I don't think I'd had enough lager that night, as they were awesome at Milton Keynes - overcoming the awful sound system by simply playing very, very loudly.